The novella is about how making art can deliver emotional salvation, as well as the relationships between the main characters, and how war has affected their lives. Dedicated to Stanislaw Frenkiel – 1918 – 2002 www.frenkielart.com. This is a fictionalised account of his life but the paintings described in the text and reproduced here are real. The tale will unfold week by week, through Stefko, Jerome, Martha and the paintings. Knuckles rapped at his bedroom door, ‘Breakfast in ten bro’. ‘Yeah,’ lied Jerome, who was already dressed: jeans, white tea shirt and a pair of black trainers – nice stuff from Walthamstow market. He checked the mirror, to see what fifteen looked like. It looked like fourteen but a lot bigger, and with a glint in his eye – Martha’s taking him out. As Carlton, his key worker went to knock on more bedroom doors, Jerome bounced down the stairs to the dining room, the emotional centre of the house where warm cooking smells raised the spirits of children sulking in their bedrooms. It was also the place where the residents’ artwork was displayed. There were several Rorschach inkblots. Sean had a stick drawing of his sister, Amy a print made with potatoes. Jerome’s were photographs; a crumbling wall, gnarled tree trunks in the forest, arrangements of fruit and veg on the market stalls and several portraits. He’d taken plenty of the other kids here but they couldn’t go on the wall in case bad people saw them and wanted to find them and hurt them, but adults were OK. The Somali cook in her overalls, Carlton in his hat, and Martha, squinting into a summer sun in the forest, her smile making pleats at the corners of her eyes, her scraped back hair the colour of dirty straw. The look she’s giving the photographer – the sun behind him – is direct and complete. ‘Where you’re goin’?’ asked Carlton, now putting boxes of cereal on the table. ‘National Portrait Gallery,’ announced Martha, striding into the dining room in a long skirt, boots and jacket, a back-pack slung across her shoulders, a long blond plait hanging down her back. Jerome’s heart leaped. She looked like a warrior he’d seen in a history book, but with lipstick, and that lovely flowery smell that hung about her. ‘Happy birthday, Jerome,’ she said. ‘Thank you,’ he replied, reddening, feeling suddenly younger than his just achieved fifteen years. ‘Where’s the others Carlton?’ said Martha. ‘Can’t – too much paperwork, just don’t make no…’ grinning at Jerome ‘ …allegations man.’ He joked. ‘It’ll be my word against his Carlton,’ parried Martha, looking at the ground. ‘Can I borrow the camera again Martha?’ ask Jerome. ‘Good idea,’ said Jerome, having no idea where Green Park was. ‘You can’t take pictures in here, Sir,’ huffed the attendant at the revolving door, pointing at the camera slung round Jerome’s neck. He shrugged at Martha, pleased to be looking grown up enough to be called Sir. ‘Alright,’ he said, handing over the camera, wondering about ‘love.’ Did that mean that she loved him? Surely not, she called other children love, and she couldn’t love them – could she? They walked up the central staircase together. Jerome felt like part of a couple, maybe getting married, the warm smell of coffee coming up from the basement helping to fix this memory forever, like the liquid in the tray in the darkroom. Were all art galleries like this? They reached a landing of paintings of pale men and women, their eyes lidless, peering out of frothy white ruffs. ‘Tell you about them on the way back,’ she said, touching the small of his back to move him on, a small current of electricity passing through his body. As they walked through the room he saw Martha’s face in a woman called Catherine Parr; the paleness of skin, pulled back yellow hair, longish nose, that full top lip – something soft yet defiant in the expression. They walked up another short flight, turning right into a dimmed room, the touch still with him, and then on, through a wide corridor of of elderly white men; generals, politicians, statesmen – pale faces emerging from dark suits and uniforms, looking down as if they owned everything they saw. ‘Dead art of the British Empire,’ said Martha, waving her arm dismissively. ‘Yes?’ she said, stopping by a portrait of a tall man decorated like a Christmas tree. ‘Of course,’ she said, nodding slowly. ‘Not yet,’ said Jerome, touching her arm, lightly, just to see if he could, how she’d respond. ‘Come on, there’s a portrait I’d like you to see, ‘ she said, pulling away, walking into the next room. Jerome saw him instantly: a painting with the same proportions of light and dark as the others, but in reverse. Instead of a pale face emerging from the gloom, a black one shining out of the white of his robe and turban, black hair bunched in contrast to a background of muted beige. A painting perfect in its colour balance – a brick red band of fabric on top of his turban, the same red as the small Quran around the man’s neck. Jerome stepped towards the portrait to read the man’s face, to try to discover any trace of his ordeal. The eyes were determined, but soft, looking straight at him. No judgment, no hatred. The face of a man of great knowledge, a man who’d kept his humanity. 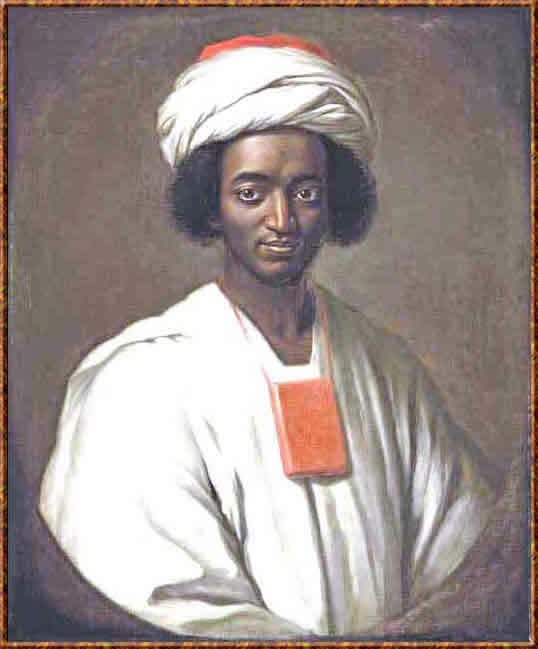 ‘Abuya Suleiman Diallo’, replied Martha, squinting at the caption, painted in 1733 by William Hoare of Bath. Jerome leaned towards the caption too, their heads almost touching, he could aim a kiss her now, but what was in her mind? Not knowing, not possibly knowing, he stared at Abuya Suleiman Diallo, understanding that this man owned nothing but himself; that the terrible things he’d seen and experienced were forgiven. But were they forgotten? No matter. He felt in that moment, that even more than kissing Martha, he knew what he wanted to do. He would make portraits for his living, try to get to art school, try to make portraits that captured that look. ‘We need to go,’ said Martha, looking at her watch. And they retraced their steps, down the stairs, past the Tudors in their ruffs. Neither of them remembering to tell or ask who they were. This entry was posted on 28 July, 2016 in homepage and tagged Abuya Suleiman Diallo, Jan Woolf, William Hoare of Bath. Bookmark the permalink.